As university lecturers in the UK remain locked in a dispute with their employers over pay and working conditions in Higher Education, a survey published by private student loan company Future Finance this week revealed that less than half of students think their degree will help them get a graduate job to pay off their debts. The issues are two sides of the same coin: the commodification of Higher Education. With home students now paying tuition fees of £9,000 per year, they rightly ask for value education in return. This involves among others high-quality teaching, well-stocked libraries, a wealth of electronic resources and specialist equipment, modern teaching and learning spaces, and decent student accommodation. 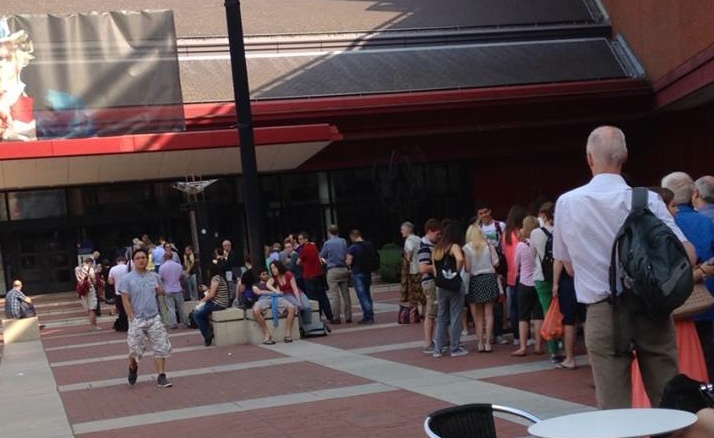 Recently, an American friend of mine posted this picture of the morning queue a the British Library on Facebook. It seems to say a lot about an unashamed nerdiness (or rare regard for learning) in this country as well as about the British love for queuing. Having grown up in Germany, I usually find myself at the front of that queue no later than 9.15am reading The Guardian, waiting for the doors to open at 9.30am. Beating the BLQ is the beach towel equivalent in the world of scholarship. The British Library is my Mallorca, my Lanzarote. Naturally, I’ve already put all the things I might need in the Reading Room in a clear plastic bag, so I can head straight down to the lockers, stow away my coat, handbag and laptop case and secure a place on the beach of learning. No minute of my valuable research time will be wasted! In the summer months, the British Library is the coolest place to be. Literally. While other people were moaning about the heat last Saturday, I found myself freezing in the air-conditioned Rare Books Room despite wearing my denim jacket and an extra pair of leggings with my light summer dress. Presumably they need to keep the room at a certain temperature to help with the preservation of the valuable printed material held here. But it’s almost normal for us nerds to come home with the obligatory British Library summer cold. The best advice I can give my research students before heading down to the BL is therefore not to remember to take all their documents, bank statements and electricity bills to obtain a library card. It is this: take a cardigan!